Pop quiz! 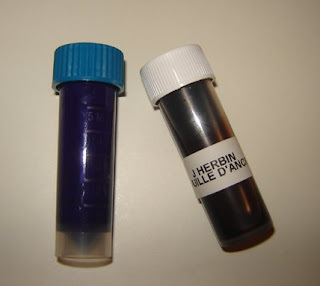 Who can spot the difference between the two vials in the photograph? What won't be obvious to anyone except for me and perhaps a fellow in Cambridge, ON, is that the vial on the left cost over $11.04 to cross this great nation of ours, while the vial on the right, a mere $1.38. That's right, if you were to participate in an ink exchange within Canada, sending a single vial could set you back over $11 (and that's not including the cost of the padded envelope). Strangely, it costs less to send the same vial to the States. This didn't really sit right with me, and it didn't sit right with dimeotane on the Fountain Pen Network, either. So he decided to do something about it. After I chose one of his inks to try out, he sent out the vial (plus an empty one for me to send back with one of my inks, as I'm fresh out of vials) taped with a bit of painter's tape and placed in a zippered baggie, sandwiched between two pieces of cardboard, and stuck in a plain lettermail envelope with three 46 cent stamps (the cost for oversized/irregular mail up to 100g is actually $1.18, but that's ok). And the vials arrived intact, not a drop spilled and not a tear in the envelope. Now it's my turn to send back his choice of ink (Noodler's Eternal Brown, in case you were wondering) and the little experiment is complete! Of course, this got me thinking, sending out samples of ink is all very fine and well, but I'm pretty sure that the local members probably have a good selection of inks as well. So I'm going to post a link to my ink list on my profile, and if anyone wants to try any of my inks, I'll bring them along to the next meeting. I'll be updating my list as I get more inks, and I invite everyone else to post their list and participate as well! OOh, yes! Actually, De Atramentis also has a tobacco scented ink! You have an amazing number of inks! What about doing up a page (maybe using a dip pen) that shows what they all look like, so people at the meeting will have an idea if they'd like to try them.